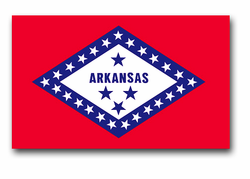 This Arkansas 3' x 5' state flag is 100% Nylon with superb construction complete with a heavy canvas heading and brass grommets. This flag meets all state specifications.And is made in the U.S.A. its quality is guaranteed! Our State Flags make an excellent addition to your collection or a great gift.